Ischemia is the most common cause of acute renal failure. Ischemic-induced renal tissue hypoxia is thought to be a major component in the development of acute renal failure in promoting the initial tubular damage. Renal oxygenation originates from a balance between oxygen supply and consumption. Recent investigations have provided new insights into alterations in oxygenation pathways in the ischemic kidney. These findings have identified a central role of microvascular dysfunction related to an imbalance between vasoconstrictors and vasodilators, endothelial damage and endothelium-leukocyte interactions, leading to decreased renal oxygen supply. Reduced microcirculatory oxygen supply may be associated with altered cellular oxygen consumption (dysoxia), because of mitochondrial dysfunction and activity of alternative oxygen-consuming pathways. Alterations in oxygen utilization and/or supply might therefore contribute to the occurrence of organ dysfunction. This view places oxygen pathways’ alterations as a potential central player in the pathogenesis of acute kidney injury. Both in regulation of oxygen supply and consumption, nitric oxide seems to play a pivotal role. Furthermore, recent studies suggest that, following acute ischemic renal injury, persistent tissue hypoxia contributes to the development of chronic renal dysfunction. Adaptative mechanisms to renal hypoxia may be ineffective in more severe cases and lead to the development of chronic renal failure following ischemia-reperfusion. 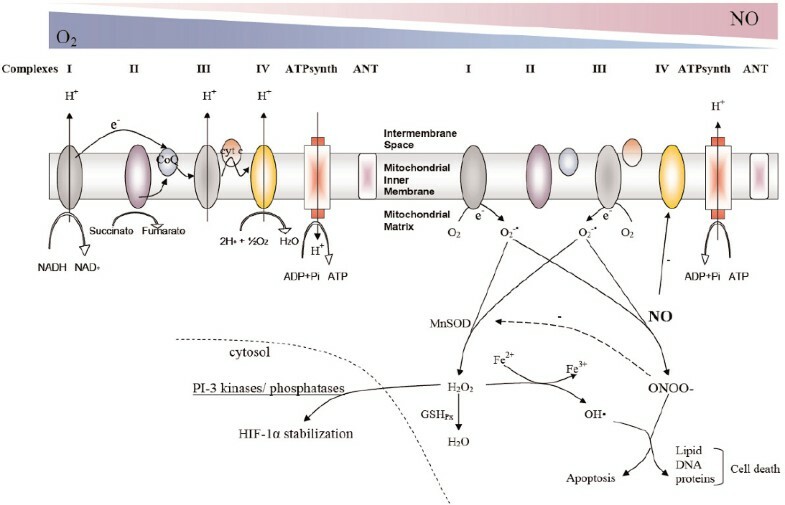 This paper is aimed at reviewing the current insights into oxygen transport pathways, from oxygen supply to oxygen consumption in the kidney and from the adaptation mechanisms to renal hypoxia. Their role in the development of ischemia-induced renal damage and ischemic acute renal failure are discussed. Acute renal failure (ARF) is a common condition that develops in 5% of hospitalized patients. Of the patients who develop ARF, ∼10% eventually require renal replacement therapy (1). Among critical care patients who have acute renal failure and survive, 2% to 10% develop terminal renal failure and require long-term dialysis (2,3). There is clear evidence that the occurrence of acute renal failure is associated with excess early and late mortality, and also with high financial costs (2,4,5). The kidneys are particularly susceptible to ischemic injury in many clinical conditions such as renal transplantation (6), treatment of suprarenal aneurysms (7), renal artery reconstructions, contrast agent-induced nephropathy (8), cardiac arrest, and shock. One reason for renal sensitivity to ischemia is that the kidney microvasculature is highly complex and must meet a high energy demand. Under normal, steady-state conditions, the oxygen (O2) supply to the renal tissues is well in excess of oxygen demand. Under pathological conditions, however, the delicate balance of oxygen supply compared with demand is easily disturbed owing to the unique arrangement of the renal microvasculature and its increasing numbers of diffusive shunting pathways (9,10). The renal microvasculature is serially organized, with almost all descending vasa recta emerging from the efferent arterioles of the juxtamedullary glomeruli. Adequate tissue oxygenation thus partially depends on the maintenance of medullary perfusion by adequate cortical perfusion. This, combined with the low amount of medullary blood flow [∼10% of total renal blood flow (11)] in the U-shaped microvasculature of the medulla, allows O2 shunting between the descending and ascending vasa recta and contributes to the high sensitivity of the medulla and corticomedullary junction to decreased O2 supply (12, 13, 14, 15). The effects of limited O2 supply are aggravated by the high O2 demand associated with the high tubular O2 consumption necessary for solute exchange (16) and the high rate of aerobic glycolysis (17). It is these conditions, working in parallel, that make the kidney highly susceptible to hypoxic conditions (18,19). 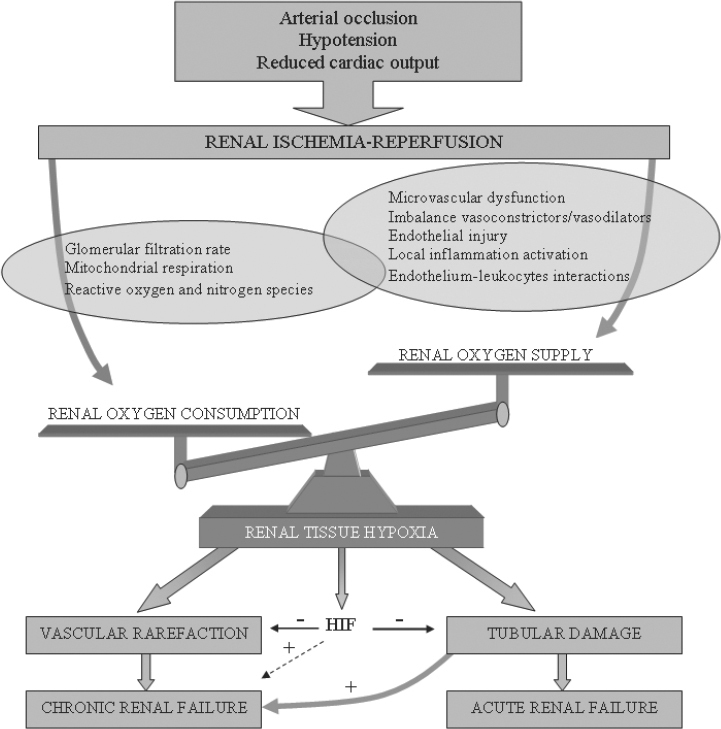 Whereas past investigations have focused mainly on tubular injury as the main cause of ischemia-related acute renal failure, increasing evidence implicates alterations in the intrarenal microcirculation pathway (20, 21, 22) and O2 handling (23, 24, 25). Indeed, although acute tubular necrosis (ATN) has classically been believed to be the leading cause of ARF (6,26), data from biopsies in patients with ATN have shown few or no changes consistent with tubular necrosis (27). The role played by microvascular dysfunction, however, has generated increasing interest. The complex pathophysiology of ischemic ARF includes the inevitable reperfusion phase associated with oxidative stress (28,29), cellular dysfunction, and altered signal transduction (30). During this process, alterations in oxygen transport pathways can result in cellular hypoxia and/or dysoxia. In this context, the distinction between hypoxia and dysoxia is that cellular hypoxia refers to the condition of decreased availability of oxygen due to inadequate convective delivery from the microcirculation. Cellular dysoxia, in contrast, refers to a pathological condition where the ability of mitochondria to perform oxidative phosphorylation is limited, regardless of the amount of available oxygen. The latter condition is associated with mitochondrial failure and/or activation of alternative pathways for oxygen consumption (31). Thus, we would expect that an optimal balance between oxygen supply and demand is essential to reducing damage from renal ischemia-reperfusion (I/R) injury (Figure 1). As discussed below, many factors can lead to a reduced oxygen supply at the microvascular level (32), including endothelial damage and leukocyte plugging. The negative effects of reduced oxygen supply on tissue oxygen levels may be aggravated by altered cellular oxygen consumption (dysoxia), due possibly to mitochondrial dysfunction and activity of alternative oxygen-consuming pathways (factors are discussed below). Synthetic representation of mechanisms involved in renal tissue hypoxia leading to acute and chronic renal failure after ischemia-reperfusion. Renal tissue hypoxia reflects an imbalance between oxygen supply and oxygen consumption. Renal tissue hypoxia participates to further tubular damage and acute renal failure. Recently the role of renal hypoxia has been proposed in development of chronic renal failure. HIF, hypoxia-inducible factor; −, protect; +, promote. Factors that disrupt this balance can be expected to contribute to the pathogenesis of ARF. This article provides an overview of how renal oxygenation pathways are affected by I/R in the kidney and how these processes affect organ failure. We will review the contribution of factors related to the pathogenesis of ischemic acute renal failure that involve imbalances between renal O2 supply and demand. We will also discuss the adaptive mechanisms that respond to acute renal ischemia and how imbalances in renal oxygenation imbalance contribute to the development of ischemia-induced acute renal failure. We will conclude with how our current understanding of the pathogenesis of ARF may affect future therapeutic strategies. Reperfusion after ischemic injury results in a partial recovery of renal blood flow, with a reduction in renal blood flow of up to 50% after reperfusion (33). This persistent reduction in total and regional renal blood flow (34, 35, 36) was described several decades ago as the “no-reflow” phenomenon (37). Recent work using intravital microscopy techniques has provided new insights into the central role of microvascular alterations and tubular damage in ischemic kidney injury leading to renal dysfunction (21). Many factors have been proposed to explain this phenomenon, such as an imbalance between vasodilatory and vasoconstrictive mediators, endothelial congestion, increased endothelial permeability leading to interstitial edema that compresses the peritubular capillaries, increased leukocyte adherence, and the extravascular accumulation of leukocytes. Persistent reductions in renal tissue oxygenation due to reperfusion have been directly measured by O2 electrodes and phosphorescence measurements in animal models of reperfusion injury and sepsis (38,39). The persistence of depressed regional blood flow and consequent renal tissue oxygenation is thought to play a pivotal role in the occurrence of acute renal failure after an ischemic injury, especially in the corticomedullary junction and the outer medulla (9). Endothelial dysfunction plays a central role in jeopardizing renal O2 delivery at the microcirculatory level. In the next section, we discuss the role of the endothelium in the development of (micro)vascular dysfunction and its contribution to ischemia-induced renal injury. Most of the descending vasa recta providing blood to the medulla arise from efferent arterioles of juxtacorticomedullary nephrons (13). Vascular smooth muscle cells (including pericytes) around these descending vasa recta have vasoconstrictive properties (40). Thus tonic modulation of afferent and efferent arterioles and the descending vasa recta contributes to the regulation of renal O2 supply and medullary blood flow, respectively. The endothelium plays a key role in flow regulation, permeability, cell trafficking, signaling, and immunologic functions (32). In this context, endothelial dysfunction is defined as impaired vasorelaxation in response to endothelium-dependent vasodilators, such as acetylcholine (ACh). Such endothelial dysfunction has been shown to participate in postischemic vasoconstriction following reperfusion (41). Although the mechanism behind this dysfunction remains unclear and various contributing factors have been suggested, the nitric oxide (NO) pathway is thought to be a main player (42,43). NO is well known for its role in vascular tone regulation by acting on vascular smooth muscle cells to induce vasodilation (40,44). NO is generated by the enzymatic transformation of L-arginine and O2 into L-citrulline and NO; this reaction is catalyzed by an enzyme called nitric oxide synthase (NOS), which exists in three different isoforms, all of which are found in the kidney (42,45). Whereas endothelial NOS (eNOS) is found in the vasa recta, inner medullary collecting duct, and glomeruli (46,47), inducible NOS (iNOS) can be expressed by vascular smooth muscle cells, renal tubular cells (39), and immune cells such as monocytes, macrophages, and neutrophils (42,48, 49, 50). In the kidney, nNOS is expressed in cells of the macula densa and seems to participate in tubuloglomerular feedback, but has minimal effect on medullary perfusion (51,52), in contrast to eNOS (53). NOS inhibitors have been shown to induce hypoxic medullary damage in models of renal ischemia, highlighting the role of NO in maintaining regional renal blood flow under these conditions (54). Despite having a common end product (NO), activating different types of NOS can have very different effects on renal tissue, depending on both the temporal profile and topography of NO production by each NOS enzyme (42). iNOS-derived NO appears to participate in vascular dysfunction (55,56), and it is therefore thought that NO generated by iNOS is harmful, leading to tissue damage (43,55,57). Several in vivo and in vitro investigations have demonstrated that inhibiting the expression or activity of iNOS (58,59) or even the absence of iNOS itself (60) can prevent renal I/R injury. The two main pathways of iNOS-derived NO-induced damage are thought to be the generation of peroxynitrite, causing endothelial dysfunction (60,61), and the inhibition of eNOS-derived NO, resulting in the inability to buffer vasoconstrictive agents (45,58). Conversely, infusing nonselective NOS inhibitors that block eNOS activity has been shown to worsen both cortical and medullary blood flow and oxygenation (45,62). Indeed, eNOS-derived NO may act in a paracrine fashion, affecting surrounding cells and preventing vascular dysfunction by inhibiting platelet aggregation and preventing leukocyte activation (63), as well as having a direct vasodilatory effect (54). The inability of hypoxic endothelial cells to produce NO could thus have detrimental effects and participate in renal damage (64). To highlight the role played by endothelial cell dysfunction after renal ischemia, Brodsky et al. (65) intravenously injected human umbilical vein endothelial cells (HUVECs) into a rat kidney transiently exposed to ischemia. HUVEC injection improved blood flow in peritubular capillaries as well as renal function. 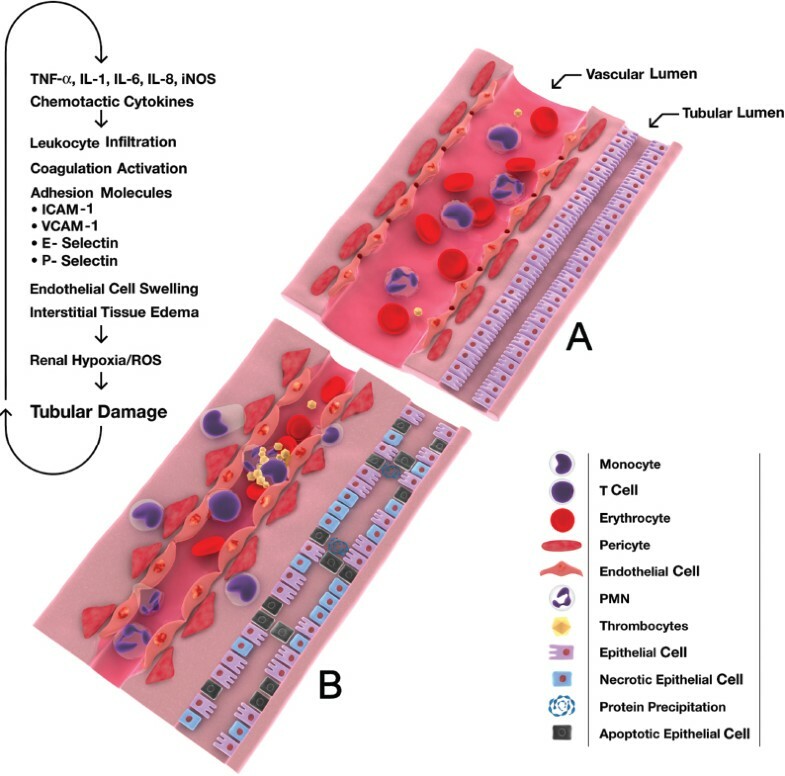 In the same study, implanting cells expressing functional eNOS also improved renal function, suggesting a pivotal role for the dysfunction of both endothelial cells and eNOS in postischemic renal injury. Incomplete restoration of endothelium-dependent vasodilation, however, suggests that other pathways could be involved in this dysfunction, such as prostaglandins or endotheliumderived hyperpolarizing factor (EDHF) (66,67). Furthermore, during I/R, a lack of tetrahydrobiopterin (BH4)—an essential cofactor of NOS—has also been implicated in endothelial dysfunction after I/R injury (56). Deficits in BH4 lead to eNOS uncoupling and the oxidation of O2, which causes the enzyme to produce superoxides and generate peroxynitrite instead of NO (68). The administration of BH4 before I/R has been shown to protect the kidney from damage following I/R (69). O2 pressure can also interfere with NO bioavailability (55). For example, NO is generated in response to decreased arterial O2 partial pressure, thereby causing vasodilation and an increase in capillary recruitment and blood flow (70, 71, 72). In addition, medullary vasoconstriction induced by indomethacin and radiological contrast media causes hypoxia, and has been shown to increase NO availability (72). Hypoxia can increase NO release from red blood cells, possibly through modifying the allosteric and electronic properties of hemoglobin, such as by decreasing the amount of the S-nitrosylated form of hemoglobin (73). Another mechanism responsible for hypoxia-induced NO release by red blood cells occurs through the nitrites (74). In addition to decreased vasodilation proprieties, arterioles can exhibit increased reactivity to vasoconstrictive agents (75). Many vasoconstrictive agents have been suggested to accompany the postischemic increase in vascular tone, including endothelin, angiotensin II (76), thromboxane A2 (77), leukotriene C4 (78), adenosine (14), endothelium-derived prostaglandin H2, and sympathetic nerve stimulation (13,18). These abnormalities in vascular reactivity have been associated with increases in cytosolic Ca2+ (79); such increases in intracellular Ca2+ may also cause cell death by inducing the activation of proteases, phospholipases, and pro-apoptotic pathways (80). Of all the vasoconstrictive agents, endothelin seems to be particularly important, because endothelin-1 levels have been found to increase after ischemia, and blockage of the endothelin pathway by endothelin A receptor antagonists (70,76) has been shown to protect against I/R injury. NO can counteract the effects of endothelin after I/R (81). It seems, however, that further blockage of endothelin B (ETB) receptors can be detrimental to the kidney by interfering with the recovery process (82). Eicosanoids are another class of mediators that exert complex effects on microcirculatory function after I/R. They are produced from arachidonic acid through three major enzymatic pathways: cyclooxygenase (COX), lipoxygenase (LO), and cytochrome P450 monooxygenase (83). It has long been recognized that prostanoids (made by COX-1 and -2) play a critical role in modulating renal blood flow and glomerular hemodynamics (84,85). Besides regulating the vascular tone of the glomerular afferent arterioles, prostanoids with vasodilatory properties, such as prostaglandin E2 and prostacyclin (PGI2), can oppose the effects of vasoconstrictors (catecholamines, angiotensin, and vasopressin) in hypovolemic conditions or conditions of decreased cardiac output (86, 87, 88, 89, 90). Thus, these mediators can influence medullary blood flow by controlling the vascular tone of the descending vasa recta, which likely requires the activation of the prostanoid receptors EP2, EP4, or IP (91). Leukotriene A4-derived eicosanoids (from the LO pathway) have been shown to act on the microcirculation by enhancing vasoconstriction and vascular permeability (via LTC4 and LTD4), and by mediating the local inflammatory response to increase polymorphonuclear leukocyte aggregation and adhesion to the endothelium (LTB4) (92, 93, 94). Hydroxyeicosatetraenoic acids (HETEs) and epoxyeicosatrienoic acids (EETs) from the P450 monooxygenase pathway can constrict renal vessels and glomerular mesangial cells and have been implicated in the tubuloglomerular feedback and renal blood flow autoregulation of the kidney (95,96). Further details on the complex renal pathophysiology of eicosanoids can be found in a recent dedicated review (83). Structural damage to both endothelial and vascular smooth muscle cells occurs rapidly after an ischemic insult (97). Reorganization of F-actin in endothelial smooth cells occurs after renal I/R (98). Cytoskeletal modifications observed in vitro in endothelial cells undergoing ATP depletion (99,100) or exposure to oxidants (such as H2O2) may be responsible for increased endothelial permeability and interstitial edema (101, 102, 103). Furthermore, fluorescence microscopy studies have demonstrated that microvascular flow can be impaired in peritubular capillaries owing to endothelial cell rupture or aggregation, causing intravascular obstruction after renal I/R (32,41,104,105). Sutton et al. (20) suggested another possible mechanism involved in increasing endothelial permeability. They observed a change in endothelial cell-cell junctions characterized by a rapid loss of adherens junctions (V-E cadherin) following I/R in an in vivo rat model. The disruption of adherens junctions can increase paracellular permeability and leakage from the vascular bed to the surrounding tissue (106). Endothelial cell swelling could also participate in the perfusion impairment by externally compressing capillaries and shrinking the vascular lumen (107,108), in addition to the interstitial edema (97). Indeed, endothelial cell swelling is a classic histological observation following I/R (109). Although the role of ion channel impairment in ischemia-induced ARF remains a matter of debate, such impairments have been suggested to take part in cellular volume dysregulation (110). I/R can induce membrane depolarization of endothelial cells by inactivating flow-sensitive K+ channels and hyperpolarization or depolarization through the inhibition of inwardly or outwardly rectifying K+ currents, respectively (111,112). How such changes cause volume dysregulation, however, remains to be determined. Furthermore, regional endothelial injury may activate endothelial cells in remote organs, such as the lungs, leading to acute lung injury, which further contributes to renal damage via systemic hypoxia (113). In addition, the injury of endothelial cells may induce a procoagulative response and thereby contribute to vascular obstruction and deficits in renal perfusion (114,115). Our understanding of the exact pathways involved in renal ischemia and endothelial cell dysfunction following I/R remains largely incomplete and needs further investigation. It should be emphasized that even if it is often described as an organ, the endothelium cannot be seen as a homogeneous structure. Indeed, endothelial cells differ in structure and function at different sites of the vascular tree and demonstrate diverse responses to hypoxic stimuli (116). Because of this endothelial heterogeneity and the broad range of tissue O2 pressures throughout the kidney, endothelial cells in different regions of the kidney will likely show different levels of susceptibility to ischemic or hypoxic injury (117,118). Endothelial-leukocyte interactions have classically been associated with renal I/R injury (119). Although polymorphonuclear neutrophils (PMNs) have been implicated for many years in organ damage during I/R (120), research has also implicated monocytes, macrophages, and T cells (121,122). Previous studies assessed PMN activation/infiltration using enzymatic biomarkers, such as myeloperoxidase or chloroacetate esterase. Nevertheless, these assays are not specific for PMN activation (123). Using more direct staining methods, only a few infiltrating PMNs have been observed in the renal parenchyma after I/R, whereas the number of monocytes or macrophages seems to be much higher and occurs much earlier in the time course of reperfusion (121,124). This occurred notably in the outer medulla, which is known to be sensitive to ischemic injury (124). Additionally, some studies performed with PMN-depleted animals failed to show a protective effect on renal I/R injury compared with control animals (125,126). Similarly, ischemic acute renal failure has been reported in neutropenic patients, arguing against a key role for PMNs in postischemic renal damage (127). Therefore, the concept of a more prominent role for mononuclear leukocytes in this setting has recently emerged. For example, Takada et al. (128) showed that renal function could be improved by inhibiting the infiltration of mononuclear leukocytes via blockade of the B7-CD28 co-stimulation pathway, one of the costimulatory pathways necessary for T-cell activation (129). The B7-1 pathway was further implicated in human ischemic renal tissue by indirect immunohistochemical staining of endothelial cells from the ascending vasa recta in the outer medulla (130). Moreover, CD4/CD8 double-knockout mice exhibited decreased renal dysfunction following renal ischemia, with the CD4+ subtype appearing to be the major contributor to I/R injury (131). Nevertheless, the exact mechanism by which mononuclear leukocytes are activated in this setting remains largely unknown, especially given the absence of any defined antigen. Several detailed reviews can be found on this topic (121,123,127,132). The activation of the inflammatory cascade can contribute to microcirculatory dysfunction by capillary plugging caused by the interaction between leukocytes, platelets, and red blood cells. Such plugging results in the so-called no-reflow phenomenon occurring after I/R (133). The adhesion of leukocytes to the vascular endothelium following upregulation of adhesion molecules may occur via a cytokine-release pathway (134). Modulation of the inflammatory response has been shown to improve renal function after I/R. For instance, the anti-inflammatory agent, α-melanocyte stimulating hormone (α-MSH), protects the kidney against ischemic injury but also inhibits neutrophil chemotaxis (135). Similarly, infusion of a tumor necrosis factor (TNF)-α binding protein decreased neutrophil infiltration and preserved renal function, suggesting a deleterious role for the up-regulation of TNF-α in renal I/R (136). In addition, levels of the pro-inflammatory cytokines IL-6 and IL-8 in plasma have been found to predict mortality in patients with acute renal failure (137). DNA repair processes such as poly(ADP-ribose) polymerase (PARP) activation may aggravate endothelial dysfunction and tubular damage (138,139). PARP-1 activation has been implicated in endothelial injury, as illustrated by finding a reduced number of adherent and rolling leukocyte as well as red blood cell trapping in PARP-1−/− mice after I/R (140). This mechanism is thought to involve inhibition of the PARP-1-induced inflammatory cascade. PARP-1 is involved in the regulation of inflammatory genes (141), such as nuclear factor (NF)-κB, which are implicated in leukocyte activation (134). Furthermore, overactivation of PARP-1 could lead to cell death by the activation of pro-apoptotic pathways or energy failure following the cellular depletion of its substrate, NAD+ (142). Leukocyte activation may lead to further endothelial damage by sustaining the inflammatory response, releasing cytokines and proteases and inducing oxidative stress (32). Thus, targeting adhesion molecules may help prevent ischemic damage to the kidney. Intercellular cell adhesion molecule type A (ICAM-1) deficiency or blockage has been demonstrated to provide protection from moderate renal I/R injury (120,143). Systemic moderate hypoxia alone can induce an increase in leukocyte adhesion mediated by CD11/CD18 integrins, even in the absence of complete ischemia (133,144). L-, E-, and P-selectins, expressed on the surface of leukocytes, endothelial cells, and platelets, respectively, are involved in the infiltration of leukocytes via their interaction with the endothelium by inducing rolling and sticking of leukocytes to the endothelium (145,146). Inhibition of P-selectin has been found both to improve renal blood flow in the early stage of ischemic renal injury and to confer renoprotection (145,147). Interestingly, if the infiltration of T cells occurs within the first hours after ischemia, monocyte/macrophage and T-cell infiltration occurs days following the injury (123,148). Complex interactions exist between tubular injury, microvascular injury, and inflammation after renal I/R. On the one hand, insults to the tubule cells promote the liberation of a number of inflammatory mediators, such as TNF-α, interleukin (IL)-6, TGF-β, and chemotactic cytokines (RANTES, monocyte chemotactic protein-1, ENA-78, Gro-α, and IL-8) (132,148,149). On the other hand, chemokine production can promote leukocyte-endothelium interactions and leukocyte activation, resulting in renal blood flow impairment and the expansion of tubular damage. In summary, renal ischemia triggers the activation of multiple mechanisms leading to (micro)vascular dysfunction. These mechanisms include functional endothelial dysfunction, probably involving NO as the central mediator. Endothelial dysfunction is correlated with direct endothelial injury and structural damage associated with increased vascular permeability, tissue congestion, vasomotor disorders, and inflammatory and hemostatic activation (see Figure 2). Together, these alterations compromise global and local renal perfusion, and decrease renal oxygen supply for extended periods of time after the initial ischemic insult has been effectively resolved. Interaction between microvascular injury and tubular damage before (A) and after (B) renal ischemia-reperfusion. PMN, polymorphonuclear. Adequate medullary tissue oxygenation, in terms of balanced oxygen supply and demand, depends on the maintenance of medullary perfusion by adequate cortical perfusion and also on the high rate of O2 consumption required for active electrolyte transport (13). Furthermore, renal blood flow is closely associated with renal sodium transport [the primary O2-consuming function of the kidney (16)] by limiting/increasing solute delivery to the medullary nephrons, thus reducing/increasing metabolic demands (150). As mentioned above, in addition to having a limited O2 supply due to the anatomy of the microcirculation, the sensitivity of the medulla to hypoxic conditions results from this high O2 consumption. Renal sodium transport is the main O2-consuming function of the kidney and is closely linked to renal blood flow for sodium transport, particularly in the thick ascending limbs of the loop of Henle and the S3 segments of the proximal tubules (19). Medullary renal blood flow is also highly dependent on cortical perfusion, with almost all descending vasa recta emerging from the efferent arteriole of juxtamedullary glomeruli (151). Thus, factors involved in the glomerular filtration rate strongly influence medullary oxygenation by modifying the amount of solute delivered to the tubules and local O2 consumption. Therefore, a slight decrease in renal perfusion pressure leads to decreased Na+ reabsorptive work and a subsequent increase in medullary pO2 due to a reduction in tubular O2 consumption (150). However, a profound reduction in cortical perfusion can disrupt medullary blood flow and lead to an imbalance between O2 supply and O2 consumption, if the decline in regional blood flow exceeds the decrease in tubular metabolic rate. Similarly, inhibition of tubular reabsorption by diuretics increases medullary pO2 by decreasing the activity of Na+/K+-ATPases and local O2 consumption (152). If cortical and medullary regional renal blood flow is interdependent, however, differential regulation and region-specific responses to vasoconstrictive and vasodilatory agents must exist (13). We previously showed that µpO2 in both the cortex and the outer medulla can vary independently, based on differences in O2 supply and consumption (38). This balance/imbalance in O2 renal consumption and delivery, and the components that affect this balance are illustrated in Figure 1. Dysoxia induced by I/R, in combination with impaired oxygen delivery due to microvascular dysfunction, may lead to the further deterioration of oxygen availability at the cellular level. The medulla has been found to be the main site of production of NO in the kidney. In addition to the actions described above, NO appears to be a key regulator of renal tubule cell metabolism by inhibiting the activity of the Na+-K+-2Cl− cotransporter and reducing Na+/H+ exchange (153). Because superoxide (O2−) is required to inhibit solute transport activity (154), it was assumed that these effects were mediated by peroxynitrite (OONO−). Indeed, mitochondrial nNOS upregulation, together with an increase in NO production, has been shown to increase mitochondrial peroxynitrite generation, which in turn can induce cytochrome c release and promote apoptosis (155). NO has also been shown to directly compete with O2 at the mitochondrial level (156). These findings support the idea that NO acts as an endogenous regulator to match O2 supply to O2 consumption (157), especially in the renal medulla (158). NO can bind cytochrome oxidase and cause reversible inhibition of mitochondrial respiration at nanomolar concentrations (159). Cytochrome c oxidase (cytochrome aa3, complex IV) is the terminal complex of the mitochondrial respiratory chain, which is responsible for about 90% of O2 consumption in mammals (23). NO reversibly binds to the O2 binding site of cytochrome oxidase and acts as a potent, rapid, and reversible inhibitor of cytochrome oxidase in competition with molecular O2 (160,161). This inhibition could be dependent on O2 level, because the IC50 (the concentration of NO that reduces the specified response by half) decreases with reduction in O2 concentration (156,162). The inhibition of electron flux at the cytochrome oxidase level switches the electron transport chain to a reduced state, and consequently leads to depolarization of the mitochondrial membrane potential and electron leakage. Together, these changes lead to the generation of superoxide anions (O2−•), especially by complexes I and III (156). Moncada and Erusalimsky (156) proposed that NO-induced cytochrome oxidase inhibition has a biphasic effect. A transient inhibition of cytochrome oxidase by NO can decrease the generation of O2−•, leading to potentially beneficial effects on hypoxic adaptation mechanisms. However, progression to a later phase presents a harmful response, generating a large amount of free O2 radicals. The reduction of superoxide dismutase (which converts O2−• into hydrogen peroxide [H2O2]) and the depletion of glutathione (the substrate of glutathione peroxidase, which converts H2O2 into water) result in the availability of even more O2−• that can react with NO to generate peroxynitrite (163). In addition, reactive O2 species are produced by infiltrating leukocytes, further disrupting the balance between oxidants and antioxidants. This leads to irreversible damage to the mitochondrial structures, causing downstream activation of apoptotic and other cell death pathways (25) (see Figure 3). Furthermore, reactive oxygen species (ROS) production can further impair arteriolar blood flow by inducing endothelial cell damage, leukocyte adhesion (164), and glycocalyx damage (165). Influence of NO and O2 on mitochondria activity. The mitochondrial electron transport chain includes four multiple subunit enzyme complexes of proteins (complexes I–IV), ATP synthase (complex V), and the adenine nucleotide translocator (ANT). Electrons are collected at the complexes I (NADH dehydrogenase) and II (succinate dehydrogenase) after oxidation of nicotinamide adenine dinucleotide (NADH) and of succinate, respectively, is transferred to coenzyme Q (CoQ) to give reduced CoQ. Electrons from reduced CoQ are transferred first to complex III (cytochrome bc1), then to cytochrome c (cyt c) and followed by complex IV (cytochrome c oxidase, COX), and finally to oxygen (O2) to give water (H2O). An electrochemical gradient is generated between the mitochondrial matrix and the intermembrane space by pumping protons through the inner membrane using the energy generated by the electron flow. This electrochemical gradient is then used to reintroduce protons through the complex V (ATP synthase) and to convert inorganic phosphate and ADP to ATP. The ATP, generated in mitochondria, is then exchanged for cytosolic ADP by the ANT. With increase in NO/O2 ratio, NO competitively inhibits complex IV associated with an electron leakage of the complexes chain and finally favors the generation of superoxide anions (O2−•). Hydrogen peroxide (H2O2) generated from O2−• by superoxide dismutase (SOD) contributes to hypoxia adaptation response via stabilization of HIF-α. If prolonged production of O2−• overwhelms capacity of the mitochondrial’s antioxidant system including the superoxide dismutase (MnSOD) and glutathione peroxidase (GSHpx), formation of large amount of peroxynitrite (ONOO-) and H2O2, precursor of the hydroxyl radical (OH•), via the Fenton reaction occurs. Peroxynitrite further inhibits the mitochondrial Mn-superoxide dismutase by nitration. Cytosolic (xanthine oxydase and cytochrome P450 reductases, and NOS, myeloperoxidase) and membrane (NADPH oxidase, the cytochrome P450) intramitochondrial ROS overproduction leads to cell necrosis or apoptosis. 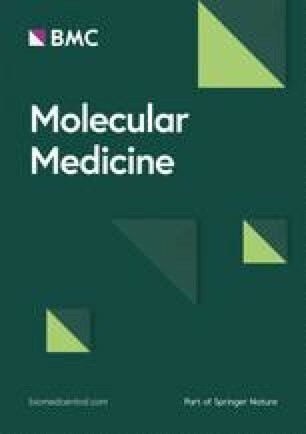 To summarize, whereas the NO/O2 ratio can act as a regulator of cellular O2 consumption by matching decreases in O2 delivery to decreases in cellular O2 cellular (166), the inhibitory effect of NO on mitochondrial respiration under hypoxic conditions further impairs cellular aerobic metabolism. This leads to a state of “cytopathic hypoxia,” as described in the sepsis literature (167). Several lines of evidence exist demonstrating impairments in mitochondria function following renal I/R (161). For example, Coremans et al. (25) used a NADH fluorescence technique to show that I/R directly affects mitochondrial activity in an isolated kidney. One area of current investigation focuses on unraveling the role of the site of NO production on the modulation of mitochondrial respiration. Indeed, the site of NO production seems to be of major importance. Stimulation of eNOS by bradykinin increases the inhibition of mitochondrial respiration, supporting the idea of a regulatory role for eNOS (168). Furthermore, Clementi et al. (169) found that only cell-secreted NO competes with O2 and to regulate mitochondrial respiration. In addition to the three isoforms mentioned above, an α-isoform of neuronal NOS, the mitochondrial isoform (mNOS) located in the inner mitochondrial membrane, has also been shown to regulate mitochondrial respiration (61). These data support a role for NO in the balanced regulation of renal O2 supply and O2 consumption after renal I/R. However, the relationships between the determinants of O2 supply, O2 consumption, and renal function, and their relation to renal damage, remain largely unknown. Future research should aim to elucidate the mechanisms that lead from decreased O2 supply to changes in O2 consumption, and to determine how adaptive or damaging their respective contributions are in the setting of renal I/R. Our group recently developed a method for measuring mitochondrial pO2 in living cells in vitro by the excitation of endogenous mitochondrial protoporphyrin IX and measurement of the decay of delayed fluorescence (170). If this method proves to be feasible in vivo, it will allow insight into the balance between oxygen supply and oxygen utilization at the intracellular level. Ischemic renal failure leads to persistent endothelial activation, mainly in the form of endothelium-leukocyte interactions and the activation of adhesion molecules. This persistent activation can compromise renal blood flow, prevent the recovery of adequate tissue oxygenation, and jeopardize tubular cell survival despite the initial recovery of renal tubular function (22,171). A 30% to 50% reduction in microvascular density was seen 40 weeks after renal ischemic injury in a rat model (104). Vascular rarefaction has been proposed to induce chronic hypoxia, resulting in tubulointerstitial fibrosis via the molecular activation of fibrogenic factors such as transforming growth factor (TGF)-β, collagen, and fibronectin (172), all of which may play an important role in the progression of chronic renal disease. Responses to hypoxia may represent an important element that prevents the onset of chronic renal failure, postrecovery. This possibility has been suggested by studies in which therapeutics that improve renal oxygenation or capillary density were shown to prevent delayed renal dysfunction after I/R. Likewise, Basile et al. (173) have shown that treatment with L-arginine, starting 3 d after renal I/R, increased renal blood flow, decreased pimonidizole staining (a hypoxia-sensitive marker), and attenuated renal damage. Kang et al. (174) used VEGF administration to stimulate angiogenesis that had been impaired in a remnant kidney model. VEGF helped maintain capillary density, reduced renal interstitial fibrosis, and stabilized renal function, although tissue oxygenation was not measured in that study. Impairment of the regenerative capacity of endothelial cells, possibly due to low activity of the telomere-synthesizing enzyme, telomerase, may be involved in postischemic vascular rarefaction (175). Progenitor cells have been suggested to be involved in endothelial repair because inhibiting the apoptosis of progenitor cells has been shown to reduce the loss of peritubular capillaries and restore kidney function in an adriamycin-induced nephrosis model (176, 177, 178). However, whether deficiencies in progenitor cellmediated endothelial repair plays a role in delayed vascular rarefaction remains to be determined (179). Rarefaction of peritubular capillaries and hypoxia precede the development of tubulointerstitial fibrosis in several animal models, supporting a link between decreased peritubular capillary density, renal hypoxia, and progression to chronic renal failure after acute injury. Additional studies are necessary to support this hypothesis, however. Oxygen deprivation is an important determinant of cellular function. Over the last decade, the role of hypoxiainducible factors (HIFs) in O2 supply and adaptation to hypoxic conditions has found increasing support. HIFs are O2-sensitive transcription factors involved in O2-dependent gene regulation that mediate cellular adaptation to O2 deprivation and tissue protection under hypoxic conditions in the kidney (180,181). HIF is a heterodimer composed of an O2-regulated α-subunit (HIF-1α or HIF-2α) and a constitutive β-subunit. In the presence of O2, two critical prolines of the HIF-α are hydroxylated by prolyl hydroxylases, which require molecular O2 as a substrate (182). The hydroxylated prolyl residues are recognized by the von Hippel-Lindau protein as a component of a ubiquitin ligase, which targets HIFα for destruction through the ubiquitinproteasome pathway (183). Under hypoxic conditions, HIF is not degraded, but instead accumulates in the cell and induces transcription of target genes after binding to a hypoxia-response element (HRE) following translocation into the nucleus (184). ROS generated by mitochondria seem to be required for HIF-α stabilization and thus contribute an O2-sensoring function for the mitochondria (166,185). The effect of NO on HIF stabilization is a matter of debate, with conflicting published results. NO generation can promote HIF-1α accumulation in a cGMP-independent manner (186). However, Hagen et al. (187) showed that NO may reduce the activation of HIF in hypoxia via the inhibitory effect of NO on cytochrome oxidase. Therefore, it seems that NO has pleiotropic effects on HIF expression, with various responses related to different pathways. HIF-1α upregulates a number of factors implicated in cytoprotection, including angiogenic growth factors—such as vascular endothelial growth factor (VEGF), endothelial progenitor cell recruitment via the endothelial expression of SDF-1, heme-oxygenase 1 (HO-1), and erythropoietin (EPO)—and vasomotor regulation (184). VEGF is known to act on the microcirculation through various mechanisms. VEGF can stimulate endothelial cell proliferation and differentiation, increase vascular permeability, and mediate endothelium-dependent vasodilation (188). Furthermore, VEGF promotes monocyte chemotaxis and the expression of adhesion molecules. Although expression of VEGF has been shown to increase in renal diseases states or during hypoxia (188), Kanellis et al. (189) did not find any increase in VEGF expression in a rat model of renal I/R, but did observe upregulation of VEGF receptor 2 (VEGFR-2). Although it has been speculated that stimulation of VEGFR-2 by tubular cells could play a role in preventing the apoptosis of adjacent endothelial cells, this question remains to be addressed. VEGF administration has also been shown to accelerate the repair of injured capillaries, probably through nitric oxide generation, in an experimental model of thrombotic microangiopathy (190). HO-1 produces carbon monoxide (a potent vasodilator) while degrading heme, which may preserve tissue blood flow during reperfusion (191). Thus, it has been suggested that the induction of HO-1 can protect the kidney from ischemic damage by decreasing oxidative damage and NO generation (192,193). Finally, in addition to its anti-apoptotic properties, EPO may restore renal microcirculation, and thus protect the kidney from ischemic damage (176), by stimulating the mobilization and differentiation of progenitor cells toward an endothelial phenotype (194) and inducing NO release from eNOS (195). HIF may also be involved in potentially deleterious responses to hypoxia, including the promotion of fibrosis. Metabolic regulation by HIF has been found to increase the expression of glucose transporter 1 and glycolytic enzymes, leading to a faster depletion of glucose resources (196). Although the precise role of HIF in hypoxia-induced cell death has yet to be determined, HIF has also been implicated in regulating apoptotic and cell death pathways. A detailed description of HIF pathway activation is beyond the scope of this review, but excellent reviews on this topic have been published (182,197). Inter- and intracell type differences exist in the ability of cells to induce HIF activity in response to systemic hypoxia (184). In the kidney, HIF-1α is expressed in tubular cells, whereas HIF-2α is expressed in peritubular cells, renal interstitial fibroblasts, and endothelial cells. Differences in HIF expression among tubular cell types have been proposed to underlie their wide disparity in vulnerability to hypoxic injury. Rosenberger et al. (180) showed that cells from the collecting duct and medullary thick ascending limbs (mTALs) have markedly different HIF responses, which were correlated with their viability during hypoxic stress and inversely correlated with tissue damage. The authors showed that HIF expression does not increase continuously with increasing severity of cellular hypoxia, and they proposed that above a certain hypoxia threshold, responses to HIF expression fail and injury may become irreversible. Therefore, the induction of the HIF response may be effective only under conditions of slight to mild hypoxic injury and ineffective in more severe cases. Further investigations will be necessary to assess potentially beneficial therapeutic strategies that target the HIF pathway. Correcting intravascular volume depletion with fluid administration and maintaining adequate renal perfusion pressure with vasopressors in vasoplegic states are both first-line strategies to preserve renal oxygen supply. There is a definite need for fluid administration during the early stages of sepsis (198,199), in dehydration states (200), or for preventing contrast-induced nephropathy (8,201), however, the volume and choice of fluid remains a matter of debate. The main goal of fluid infusion is to reestablish adequate circulation and ultimately to restore tissue perfusion and oxygenation. Correction of systemic hemodynamics does not necessarily result in the recovery of microcirculatory perfusion and oxygenation (202). Several lines of evidence show a difference in microcirculatory oxygenation and renal oxygen consumption between different fluid regimens (38). High-molecular-weight hydroxyethyl starch solutions (≥200 kDa) appear to be deleterious in terms of renal function (203,204); low-molecular-weight starch solutions, on the other hand, may improve renal tissue oxygenation by decreasing blood viscosity (205) and reducing vascular resistance, along with preventing starch molecule accumulation in the renal tubules and the disturbance of glomerular hemodynamics (206). Likewise, because low doses of dopamine are ineffective in terms of prevention or treatment of acute renal failure (201,207), norepinephrine (208) and vasopressin (209) are probably the drugs of choice for improving function in the renal macrocirculation and microcirculation. Because reaching supraphysiological hemodynamic values are at least doubtful (210) and may be harmful (211,212), the optimal fluid volume that should be given remains difficult to estimate. Indeed, based on the oxygen supply/consumption concept, maneuvers that systematically enhance the glomerular filtration rate in patients with acute renal failure may be harmful in increasing solute delivery to the tubules, and thereby the renal oxygen consumption (67). Thurau and Boylan (213) used the provocative term “acute renal success” to concisely describe the adaptive role of glomerular hemodynamics in matching oxygen supply to consumption with the ultimate goal of preventing tubular damage. Use of pharmacological interventions that act at the microcirculatory level may be a successful strategy to overcome ischemia-induced vascular damage and prevent ARF. Activated protein C (APC), an endogenous vitamin K-dependent serine protease with multiple biological activities, may meet these criteria (207). Along with antithrombotic and profibrinolytic properties, APC can reduce the chemotaxis and interactions of leukocytes with activated endothelium (214). However, although APC has been shown to improve survival in septic shock and to shorten the time to resolution of cardiovascular and respiratory dysfunction (215), renal dysfunction was not improved in the largest study published so far (215). Nevertheless, the criteria used for renal dysfunction in that study (that is, oliguria) are questionable, because oliguria cannot be considered a fully accurate marker of kidney damage. Furthermore, animal studies have suggested a protective effect of APC in sepsis-induced kidney injury (216,217). Drugs with pleiotropic effects on the vasculature, such as EPO (194) and statins (218), have the potential to prevent ischemia-induced renal failure by enhancing endothelial NO synthase expression and/or improving vascular permeability, leading to improved microcirculatory function. Based on the mechanisms mentioned above, the use of immunosuppressive drugs and approaches to inhibit leukocyte adhesion warrant further investigation, and may yield promising renoprotective effects (219,220). Finally, despite being an attractive pathophysiological model, neither drugs with renal vasodilatory effects (that is, dopamine, fenoldopam, endothelin receptor blockers, adenosine antagonists) nor agents that decrease renal oxygen consumption (that is, loop diuretics) have been shown to protect the kidney from ischemic damage (200,201). Recent common standards for the diagnosis and classification of acute kidney injury (221), and new tools for early diagnosis of renal injury (222), may reduce the striking gap between the plethora of drugs found to be efficient in animal models and their almost constant failure to improve outcome in the clinical setting. We have to bear in mind that a magic bullet to treat the highly complex condition that is renal I/R is not in sight yet, and further research is needed. We can expect that understanding the balance between O2 delivery and O2 consumption, as well as the function of O2-consuming pathways (that is, mitochondrial function, ROS generation), will be central to this treatment strategy. Growing evidence indicates that microvascular dysfunction occurs after acute renal ischemic injury, mainly through an imbalance between vasoconstrictors and vasodilators, with NO being the main mediator. These deleterious effects of NO are thought to be associated with the NO generated by the induction of iNOS and its contribution to oxidative stress, both resulting in vascular dysfunction and tissue damage. Ischemic injury also leads to structural damage to the endothelium and leukocyte infiltration. Consequently, renal tissue hypoxia is proposed to promote the initial tubular damage, leading to acute organ dysfunction. Furthermore, recent studies suggest that, after acute ischemic renal injury, persistent tissue hypoxia contributes to the development of chronic renal dysfunction. In addition to a decrease in renal O2 supply, O2-consuming pathways are affected over the course of renal I/R. Responses to the inhibition of the mitochondrial electron transport chain during I/R may contribute to either hypoxia adaptation or cell death, depending on the length and magnitude of the process. Research is necessary to clarify the respective contributions of O2 supply (for example, to determine the precise pO2 threshold that leads to kidney damage) and O2 utilization changes to renal (dys)function in the context of I/R. These studies should aim to unravel the mechanisms leading from a decrease in O2 supply to changes in O2 consumption and determine the extent to which these responses are adaptive or damaging in the setting of renal I/R. The results of these studies will hopefully lead to the development of new treatment strategies to protect the kidney from I/R injury. The authors acknowledge Richard Milstein from Skylab Industry for help with the illustration in Figure 2.